George Clooney, 45, has made it pretty clear that he has no plans to ever marry, but that doesn’t mean he doesn’t know how to have a long-term relationship. 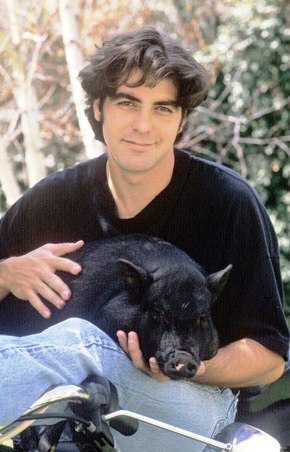 For the past 18 years he has given his heart to Max, his 300-pound potbellied pig, who he gained full custody of after his breakup with Kelly Preston (who is now married to John Travolta). 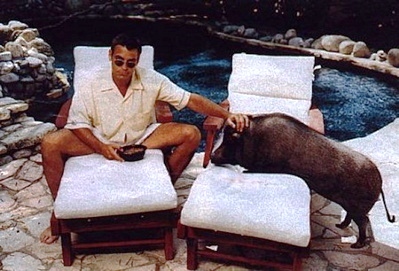 It has always been a dream of mine to have a pet pig. But I would keep mine outside. They’re smart, but they’re also quite stinky. previous post: Ugly People Are Pretty. But Only In Hollywood. next post: Will Beyonce Knowles Soon Be Mrs. Jay-Z?